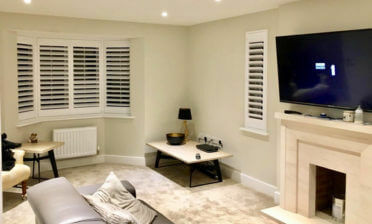 We were in Worcester Park, a suburban town in South West London to design and install some of our plantation shutters to a 5 section bay window. The customer had concerns about how the shutters would look against the Georgian leaded windows, but our Surveying Technician Daniel was able to design the shutters with thicker louvres to create the correct look for the client. The shutters were then installed by Roy and Daniel to this bay window with total accuracy as the shutters had been carefully bespoke made to the exact styling and contours of the window. 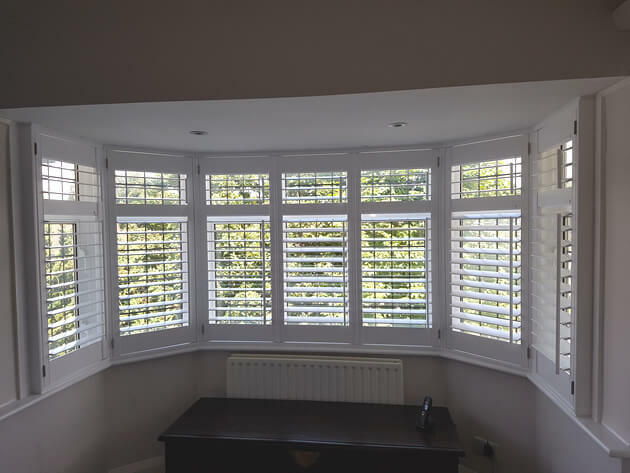 All our plantation shutters are made to measure which means that we can guarantee the perfect fit for all types of windows and openings no matter what type of home and rooms you have! 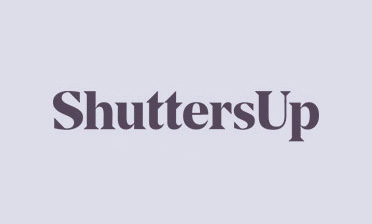 We created the shutters in a full height style with mid rails at the top, allowing for the top and bottom sections to be adjusted independently and also to match the style and lines of the windows behind. 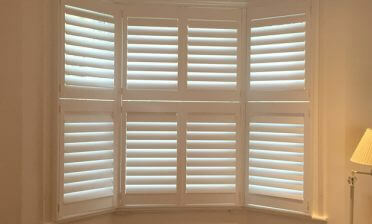 For adjusting the thick 76mm louvres there are offset tilt rods fitted to each panel. They were finished in pure white with antique brass hinges, seamlessly blending in with the room and home.